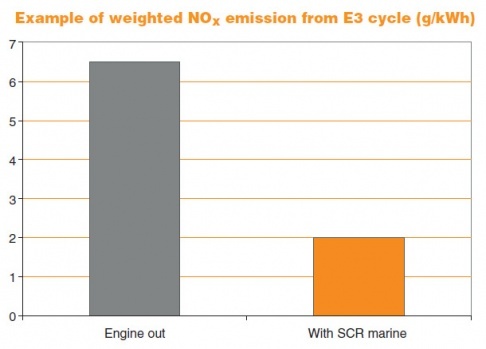 • Up to 90 % NOx reduction ( >90% in the ISO 8178 E3 cycle). • Up to 40 % PM reduction with a particulate oxidation catalyst (POC) option. • Suitable also for retrofit. This system reduces NOx through selective catalysis with urea (sometimes known as Adblue) as the reduction agent. 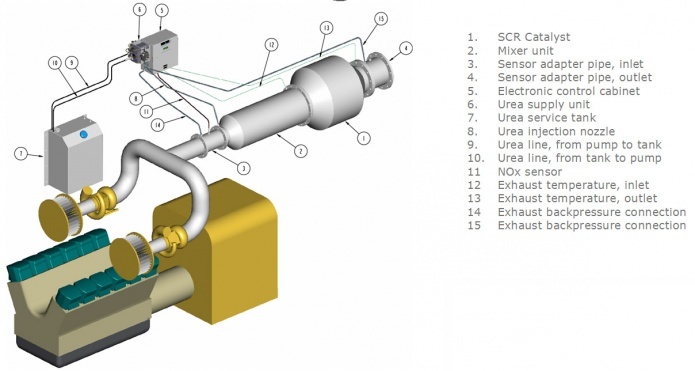 The urea will decompose to ammonia in the exhaust stream, which in turn will reduce the NOx on the SCR catalyst surface. POC, sulphur levels must be < 50 ppm. Up to 40 % PM reduction with a particulate oxidation catalyst (POC) pos.14. System configurations to fit different engine sizes.